Scammers use bots to respond to Twitter users who mention PC problems or malware. The bots search for the appropriate keyboards and send messages that include a phone number of a tech support firm. I described this approach when exploring how scammers prescreen potential victims. Scammers set up scareware websites that are designed to fool people into thinking their PC is infected, compelling visitors to call the fake tech support organization. Johannes Ullrich described a typo squatting variation of this technique in an earlier diary. Let’s take a look a domain redirection variation of this scam below. In the following example, the victim visited a link that was once associated with a legitimate website: 25yearsofprogramming.com. The owner of the domain appears to have allowed its registration to expire in early 2014. At that point, the domain was transferred to Name Management Group, according to DomainTools Whois records. The record was assigned DNS servers under the domains cashparking.com, hastydns.com, dsredirection.com and eventually brainydns.com. 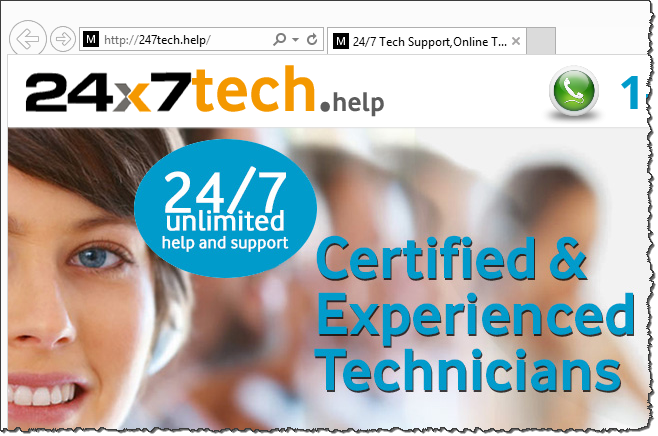 Visiting the once-legitimate URL a few days ago landed the victim on a scammy scareware page, designed to persuade the person to contact "Microsoft Certified Live Technicians" at the specified toll-free phone number. 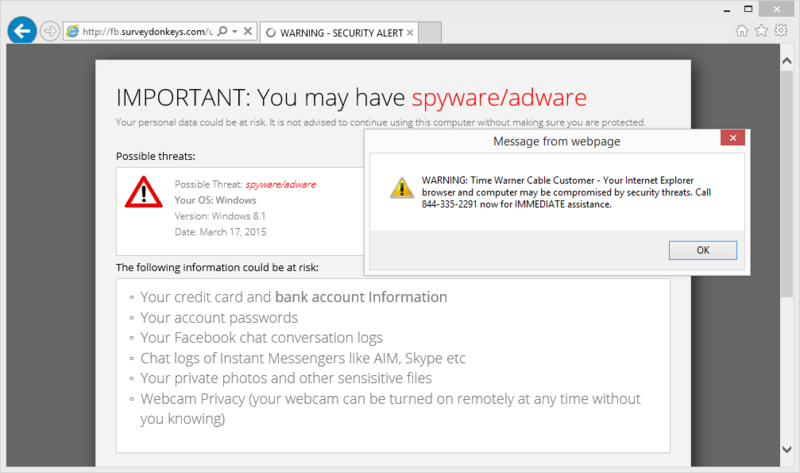 The site employed social engineering techniques employed by rogue antivirus tools. 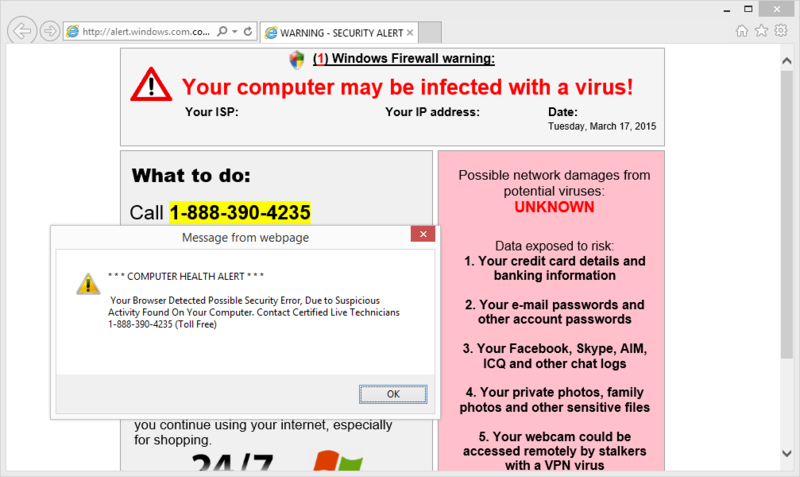 Such schemes present victims with fake virus warnings, designed to scare people into submission. "This is a Windows system warning! This is a Windows system warning! If you are hearing this warning message, the security of your Windows system has been compromised. Your Windows computer and data might be at risk because of adwares, spywares and malicious pop-ups! Your bank details, credit card information, email accounts, Facebook account, private photos and other sensitive files may be compromised. Please call the number mentioned now to resolve this issue." To see and hear what the victim experienced, play the video clip below or watch it on YouTube. 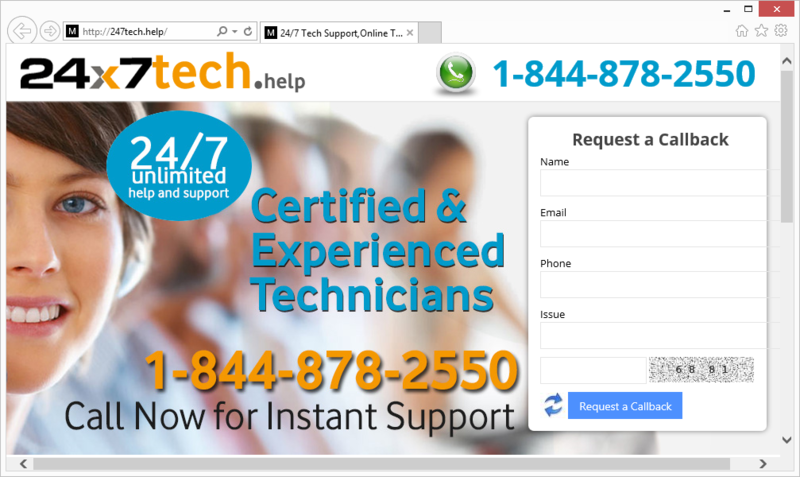 If you visited the top page of the 247tech.help website (don't go there), you would see a friendly, professional-looking page, gently inviting the visitor to "Call Now for Instant Support" by dialing 844-878-2550. Please don't call that number; however, if you'd like to hear a details account of what people experience when they do call, read my article Conversation With a Tech Support Scammer. The nature of this page is in stark contrast to the scareware warnings-filled trap shown above, which redirection victims encountered. The website hosting 25yearsofprogramming.com at the time of this writing redirects visitors to various places, perhaps randomly, perhaps based on the person’s geography or browser details. I encountered two other redirection flows that led to scareware websites set up for IT support scams. The design of this page matches closely the site Johannes Ullrich described in the typo squatting variation of this scenario on December 15. The latest page employed the sound file gp-msg.mp3 to scare visitors. VirusTotal has a record of this file, which was first uploaded to VirusTotal on December 11, 2014.
Who is Redirecting, Why and How? We seem to be dealing with two different redirection engines and companies: p2.dntrax.com and xml.revenuehits.com after the initial 25yearsofprogramming.com redirect. The domain dnstrax.com was registered by Team Internet AG, which is associated with over 44,000 domains, including several that DomainTools classifies as malicious: anonse24.de, natursteindichtstoff.de, seospecialists.de, etc. The domain revenuehits.com is registered to MYADWISE LTD, which is associated with about 50 domains. The companies behind these servers, as well as the firm presently controlling 25yearsofprogramming.com are probably receiving referral fees for their roles in the redirection scheme. There's much to explore regarding the domain names, systems and companies involved in the schemes outlined above. If you have additional information about these entities, or would like to contribute towards this analysis, please leave a comment. If you decide to explore any of these systems, do so from an isolated laboratory environment. Also, if you encounter a tech support scam, please register it with our database of such incidents. I've taken to blocking any domains that are "web ads / analytics" related whenever I run across them in a spyware/adware/malware investigation. And this post is a good example why. I *know* I've seen that revenuehits.com domain before while digging in the DNS query logs for a system that we caught downloading some piece of crapware. Whenver we see an alert about an infected system, I go sift through the DNS query logs for the last second or two leading up to the download event. I often find queries for domains/hostnames that have no redeeming value as near as I can tell, and so I often decide to block them. Yesterday this showed up.. it was pushed to AX fraud. An attempt was made to login to your Account. This attempt was blocked and for your protection we have disabled your account. This is an automated message.Please do not reply to this email. Thank you for your continued Card Membership.